Now contains the newest textbook in the series: Exploring Creation with Chemistry and Physics. 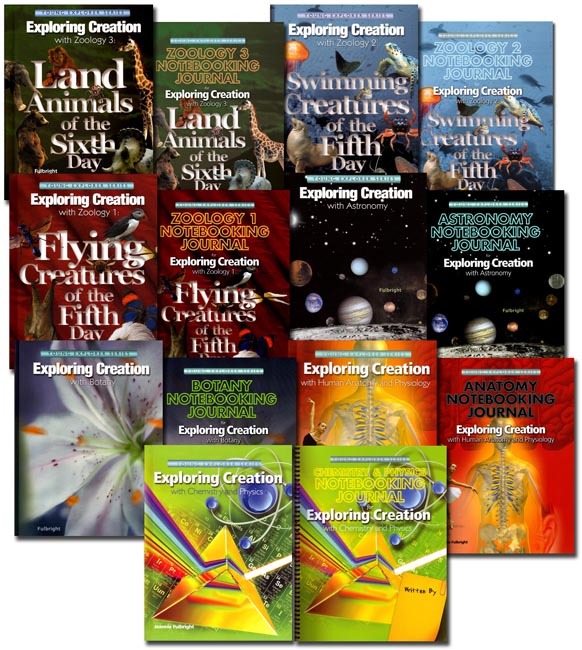 This series Set includes the following 7 quality hard cover textbooks: Exploring Creation with Zoology 1, Exploring Creation with Zoology 2, Exploring Creation with Zoology 3, Exploring Creation with Astronomy, Exploring Creation with Botany, Exploring Creation with Human Anatomy and Physiology, and Exploring Creation with Chemistry and Physics. The combined set contains nearly 2,300 pages chock-full of science material! Complementing The Young Explorers Textbooks, these 7 Notebooking Journals will provide everything your students need to complete their studies in the texts. The Notebooking Journals serve as your child's individual notebook, providing a place for them to complete every assignment, record their experiments and display their work.